With the help of some great Outdoor Gulf Coast fans, we discovered there are actually quite a few places near water to hike with your dog. 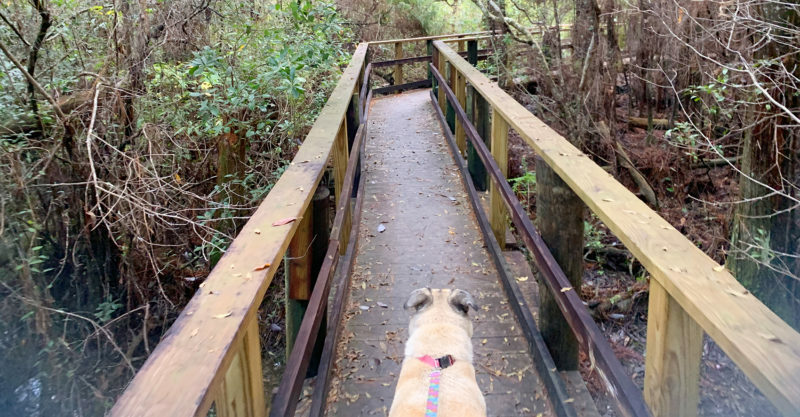 Check out this list of locations for nature hikes with your dog from Perdido Key to Panama City. 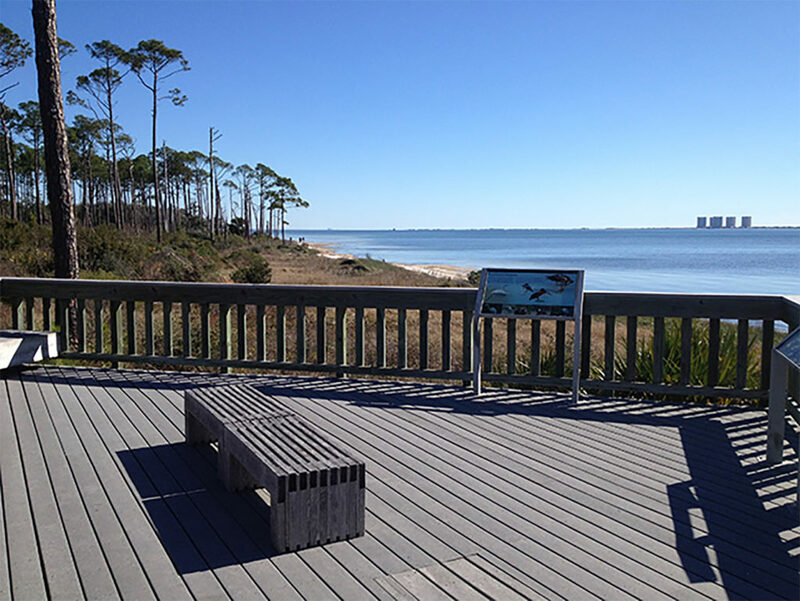 Discovery Nature Trail is located on Perdido Key at Johnson Beach. This is a nice hike for the entire family. The hike takes you on a raised boardwalk through dunes, pine trees, salt marsh outlooks, and brings you to a beautiful view of Grand Lagoon. The hike is just under 1/2 a mile long-just long enough for a fun time of exploring with young kids or an older dog. Big Lagoon State Park is more than a campground. It has 655 acres of beauty to explore. 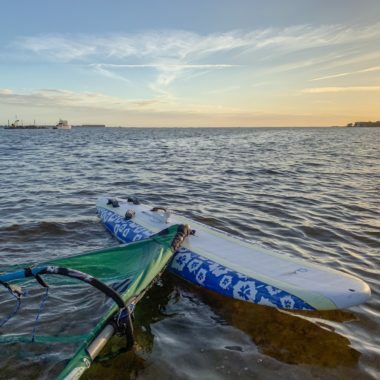 The park is located in Pensacola just across the bridge from Perdido Key. Visitors to the park can enjoy camping, hiking, kayaking, picnic areas and much more for outdoor adventures. We enjoyed a nice guided tour with Ranger Mick of Tarkiln Bayou during First Day Hikes on January 1st. She showed us which plants are native and which are invasive and discussed the problems with planting invasive species in our own yards. We also got a quick lesson on poisonous plants. Afterward, we even found a geocache with the kids. This would make a nice, easy walk with your dog. The northern terminus of the Florida National Scenic Trail is located in our own backyard in the Gulf Islands National Seashore. Just north of the Forts in Fort Pickens in the trailhead to a nice section of trail for walking your dog. On the trail, you’ll see many birds, turtles and more. Learn more about this trail. Brackenridge Nature Trail is a 0.3-mile boardwalk loop trail located in the Naval Live Oaks Park, a part of the Gulf Islands National Seashore. The trail has signs along it describing how the woodland provides food, shelter and nesting for birds, reptiles, and mammals in the area. 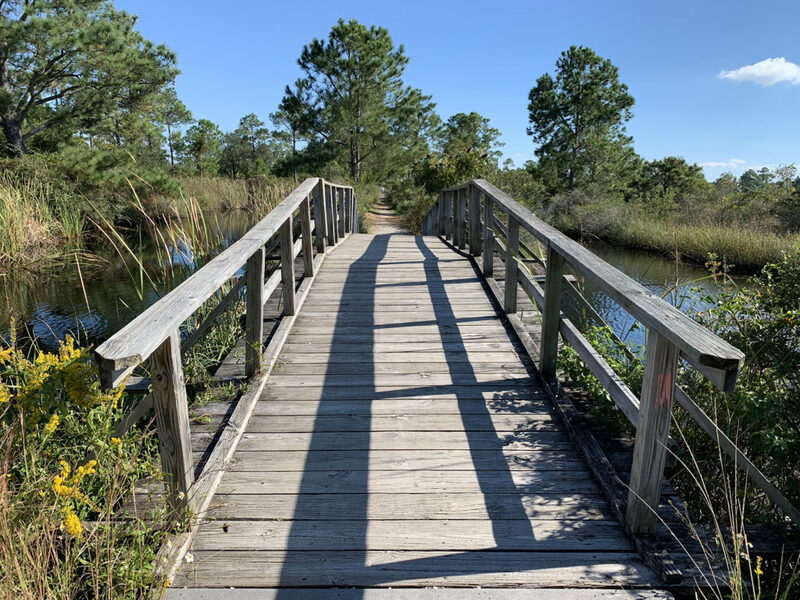 An earthen loop hiking trail also joins this wood paved trail and there is an observation platform overlooking Santa Rosa Sound. You’ll love walking your dog under the canopy of beautiful oaks and magnolias in Shoreline Park. The park includes a nice paved trail as well as nonpaved trails for hiking. The Edward Ball Nature Trail is a peaceful escape for taking your dog for hide in northeast Pensacola. 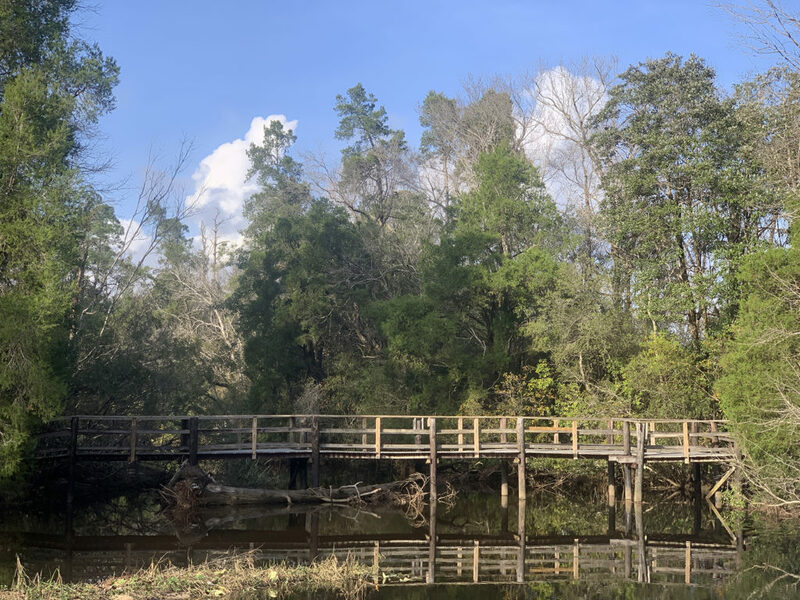 The trail is an elevated boardwalk located on the campus at the Universit of West Florida and is a fantastic location to experience closeup a natural wetland. Juniper Creek hiking trail, located in Blackwater State Forest, is a nice trail that follows along the Juniper Creek. The trail is 8.8 miles long and is a segment of the Florida National Scenic Trail. Topsail Preserve State Park has over 7 miles of trails to explore. 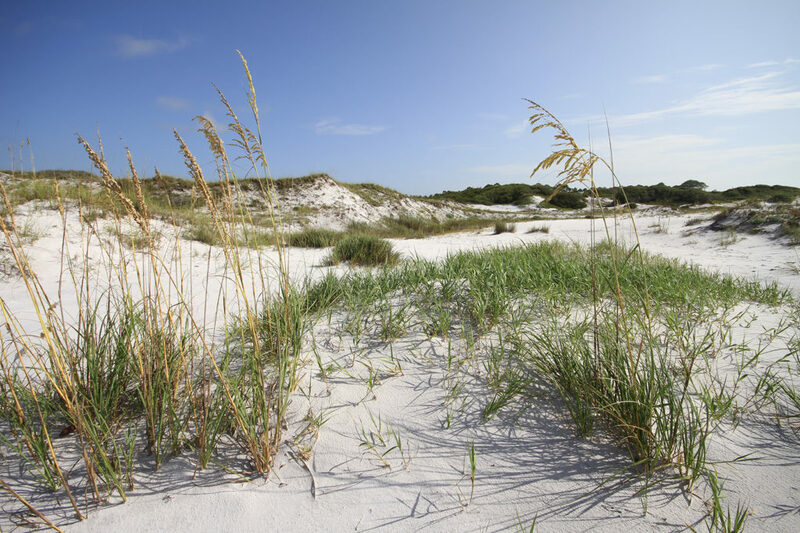 Hike through ancient dunes, explore coastal dune lakes, and more. Along Morris Lake there are 2.5 miles of hiking trails. Hike the Campbell Lake Nature Trail and enjoy an area covering over 5 miles of a diverse array of plants and animals. 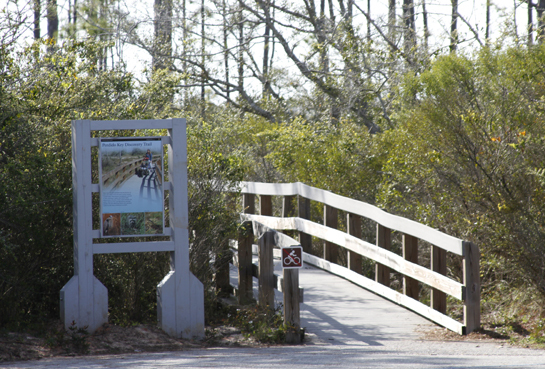 Trails in Conservation Park in Panama City are open daily from sunrise to sunset. No motorized vehicles of any kind or horses are allowed on the trails. Dogs are permitted on leashes. Trails are also great for bike riding. Part of the trails are paved. Choose from 12 trail routes from 0.6 to 11 miles in length. Pets are permitted in designated day-use areas and the camping area in Rocky Bayou State Park. The day-use area is open daily from 8:00 a.m. to sunset and there is a small entrance fee. There are several designated trails for hiking with your dog. The Red Cedar Trail hosts the impressive red cedar tree, along with many other varieties of plants, shrubs, and trees. Sand Pine Trail follows the Eastern Shore of Puddin’ Head Stream. This stream is a rare habitat unique to this area, which is a fragile ecosystem with several species of aquatic plants, such as the pitcher plant and Florida Anise. Adjacent to Sandpine Trail lies Rocky Bayou Trail. The return loop of this trail follows the picturesque shoreline of the bayou. Also, if you walk behind the Vickrey Center off Summit Blvd. in Pensacola you’ll find a nice short trail through the woods. It runs along the airport fence and is great for a little nature walk with your pet. Let us know if you discover any more nice areas for adventures with your pet.